The Amalfi coast is an awe inspiring stretch of coast line located toward the Southern end of Italy. 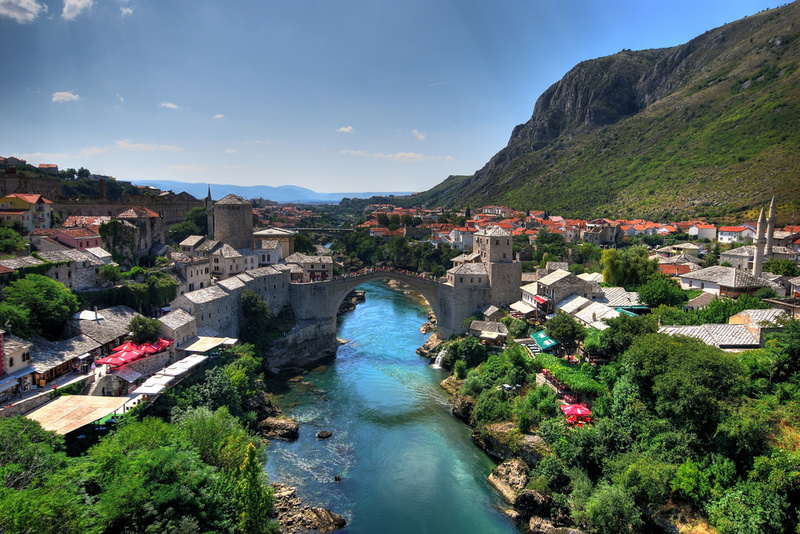 Stunning picture perfect villages that appear to be suspended into the steep cliff faces, dominate throughout this area. With its Mediterranean climate of warm summers and mild winters it’s no wonder it’s a popular destination for both tourists and Italians alike. 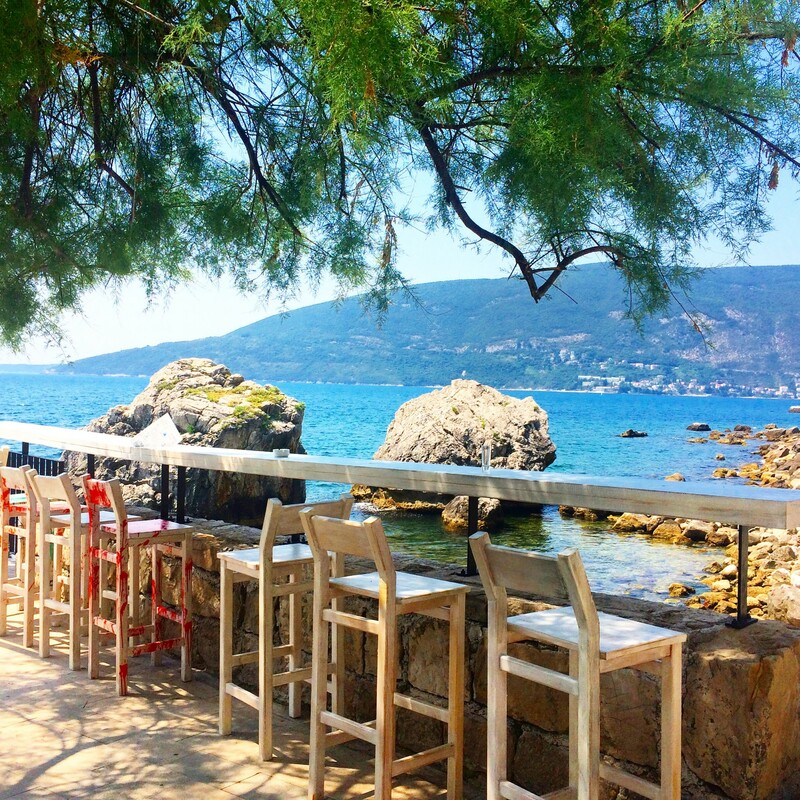 Lazy summer days spent wining and dining in beautiful outdoor restaurants or just frolicking by the sea. What’s not to love about this lifestyle! Located south of Naples, the area specializes in seafood and lemons along with the fresh local produce which is truly exciting. I don’t know if it is the climate or the carefree tender care of the Italian way but your taste buds will be delighted. The area is also known for its production of Limoncello liqueur and there are many beautiful terraced gardens filled with lemon groves throughout the landscape. You can’t leave Positano without taking home some of the local Limencello! We chose to stay in Positano, partly due to seeing it featured in one of my favourite movies Under the Tuscan Sun and being in summer, a chance to hit the beach. It has become one of my favourite places in the world to truly get lost in the lifestyle. Sure it’s touristy and one of the more popular towns on the coast but that’s what I like, lots of people having a great time. If you are looking for somewhere a little quieter then the serene Praiano is about an 11 minute bus ride down the coast toward Amalfi. Be aware that Positano is a town with lots of steep stairs and long, winding pathways that lead down to the beach and the centre of town. So given that nature you will either be going up or down in this town, to get to your hotel. If you are not too fit or you have limited mobility then you might want to stay closer to the flat area near the beach. The centre of Positano has many shops and restaurants and in summer swarms of tourists drop in for day trips via the Ferries so be prepared for crowds walking up and down streets, stairs and in shops. We stayed half way up the hill at Hotel Reginella and found the walk an easy one. The higher up you stay the lovelier the view. There are many magnificent restaurants away from the centre and the more popular ones are the ones that take in the view of the ocean. Restaurants can be open late and in summer may serve up until 11pm. Most of the locals are very hospitable and when we stayed here we came across some exceptional people. We had travelled from Rome and this was a most welcome change of pace and certainly pleasant not to have the worry of scammers and street hecklers bothering you. We as a group of 3 girls felt very safe in Positano but it’s always sensible to remain aware as you would in any country you visit. 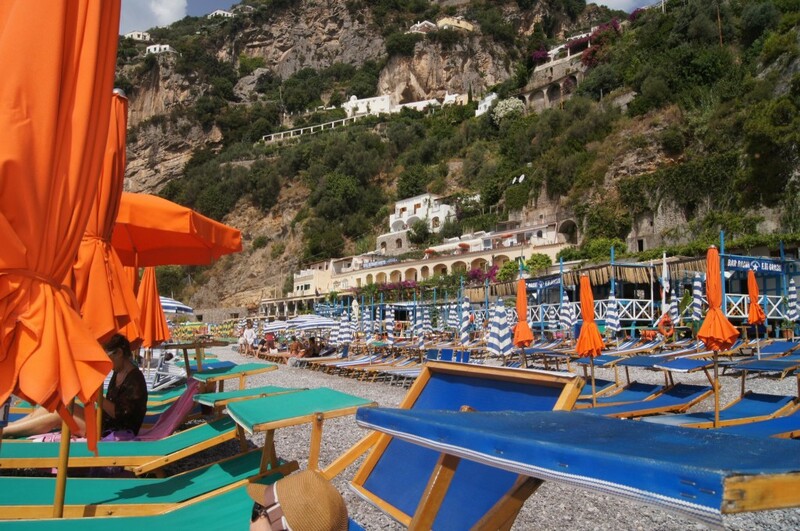 There is not a whole lot to do in Positano, other than just indulge and enjoy! Once you have looked in the shops, picked up a few souvenirs then the rest is just spent either eating or laying on the beach soaking it all in. Honestly what more could one want? The beaches don’t actually have sand but are covered in black pebbles but that is no issue when you are swimming in water that is warm and crystal clear. The two main beaches are Spiaggia Grande and Fornillo. You will need to pay to go on the beach which will include a sun lounge to use for as long as you want. Fornillo beach is a lot quieter and a little hike away but we found it much more peaceful and less expensive. By mid-afternoon the sun will have gone over the hill, so if you want to maximise the most of the sun then you will need to sit on the furthest side of the Spiaggia Grande beach, which is also the most expensive for that reason. There are some beach bars and restaurants on the Fornillo beach and one that offers free wifi. There is also a beautiful church worth a visit on the shores of Positano, it is a fine example of Byzantine art. The outside dome has a beautiful yellow exterior made of majolica tiles. It’s famous for having a thirteenth-century Byzantine icon of a black Madonna. Day trips from Positano to the Isle of Capri or the Emerald grotto are easily purchased from ticket booths on the jetty in summer. 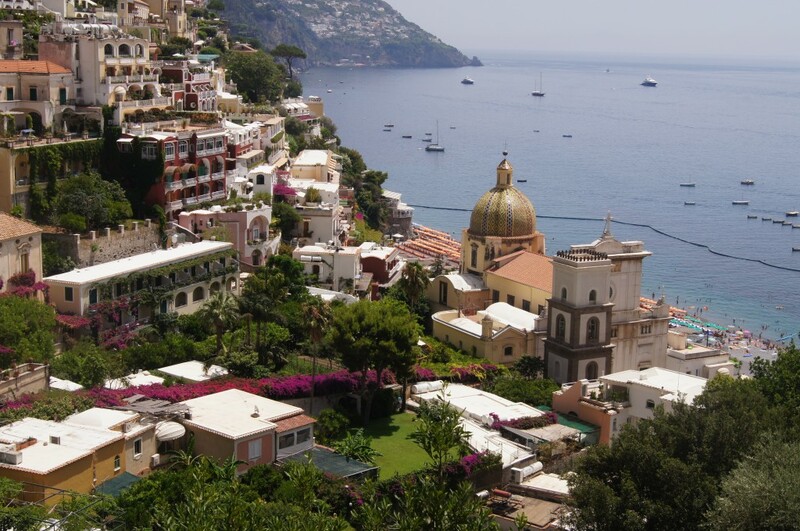 In the summer, Positano is linked to the isle of Capri by a direct ferry service. Ferries usually depart from Positano in the morning and return in the afternoon. The boat journey takes approximately 40 minutes. During the rest of the year, you will need to travel to Sorrento to catch one of the regular ferries or hydrofoils to Capri. Shopping in Positano you will find lots of interesting unique shops but if it’s clothes you are looking for I would suggest you head to the Isle of Capri for the day, where you will find high end fashion such as Prada, Louis Vuitton, Robert Cavalli alongside the more modest budget stores for us mere mortals! If you are looking for places to have a drink try restaurant bars such as the Buca di Bacco or the wine bar Next2. We decided to do a Google search and came up with the Champagne Bar at the Le Sirenuse. After having dinner on our balcony with a couple of wines we walked down to Le Sirenuse. We were not guests at the Hotel but we were extremely welcomed by staff and were seated on the balcony overlooking the ocean. I can’t recommend this place enough, the hospitality was amazing and the waiter went above and beyond with service for us. Lots of complimentary food was on offer as we sipped champagne in what was just a surreal place and view. We also visited Music on the rocks and found it to be a great club with lots of fun tourists and locals. The club is set in a cave on the beach and has a chic uber modern look. Mainly filled with tourists who want to dance and drink the night away, along with the local boys who catch the boat from the Isle of Capri over in summer. You might get a few funny stories here as we did with the local boys telling us all sorts of things from being movie stars to Olympians! Made for an entertaining night! We staggered home around 3 am, not sure how we got up the stairs but we made it back to our hotel in one piece and all limbs intact! 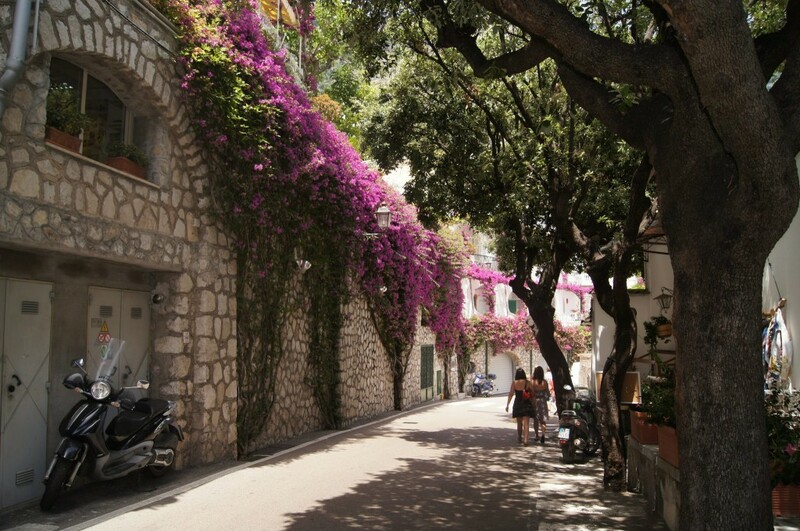 The Amalfi coast is a must see destination. If you are as far down as Rome or Naples then getting to the coast is not too difficult to get to. 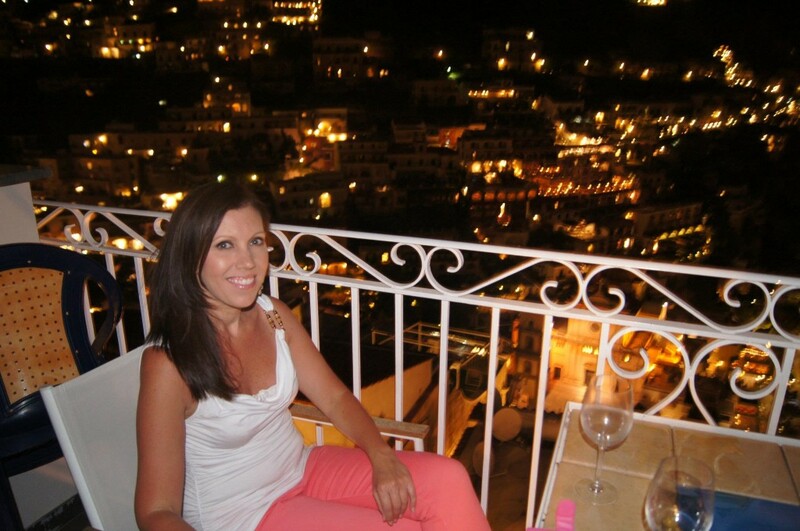 Tie it in with a trip to the Ruins of Pompeii and stay a few nights in Positano or too truly relax, stay a whole week! There are various ways of getting to the Amalfi coast, either by train, bus, car or Ferry. My recommendation is to take the train from Rome to Sorrento and then via bus to whichever village or town you haven choosen to stay. It’s easier than you may think. From Rome you will be required to take the train to Naples (depending on what train you take it can take from 1 and half hours to 2 hrs) and from there you will need to change to the Circumvesuviana line (which is a private line located below the Naples train station, just follow the signs). Once you have reached this station, purchase your tickets to Sorrento (via Pompeii) and head down the escalators to the platform. The train takes about 40-60 mins to Sorrento. Below is a helpful video on how to get from Rome to Pompeii. 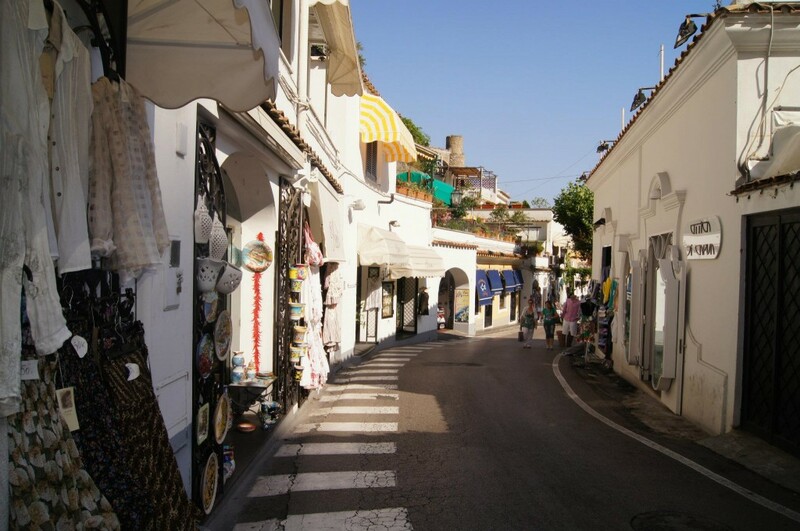 Once you reach Sorrento you will need to take a SITA bus to whichever town you are going to. 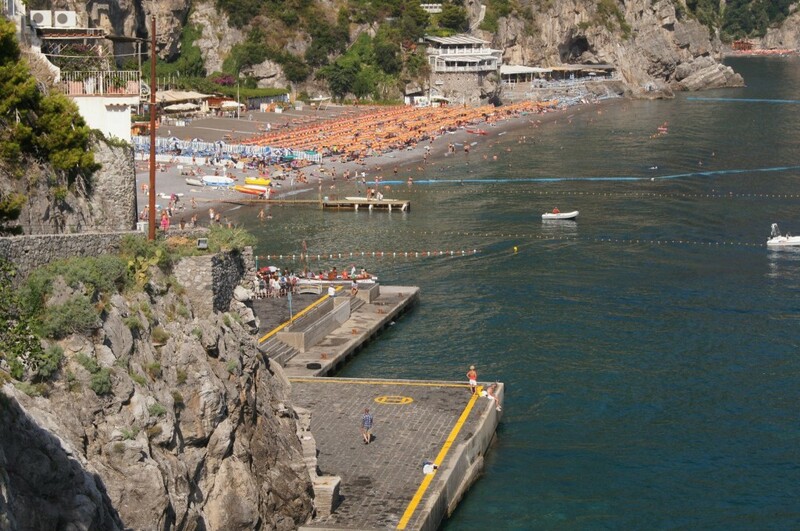 The Positano bus will stop at Praiano and then on to Amalfi. Tickets are not sold on the bus and you must purchase them at the ticket office located in front of the exit of Circumvesuviana station near the magazine shop. Buses are located outside the railway down the stairs onto the street. Be aware in the height of summer you will be standing on the road in the full sun with no shelter in a queue with lots of other tourists. So make sure you have some water and a hat. 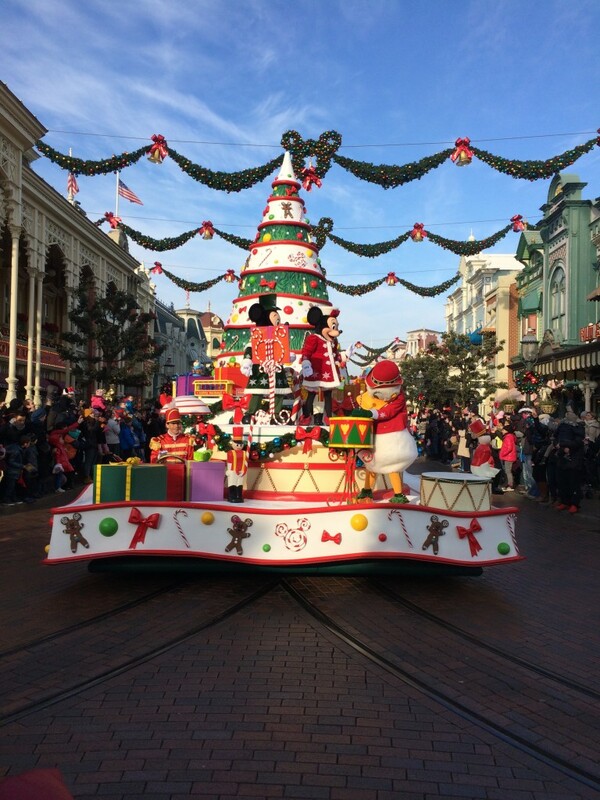 We arrived at peak time around lunchtime and there were lots of people waiting already. The buses were leaving regularly and we waited maybe around 30 minutes. Once on board the buses are air conditioned and comfortable. The ride is around 30 minutes (15km) and the views are wonderful, try and get a seat on the right hand side to take full advantage. Here is a useful link for the SITA bus timetable. You could also hire a driver and go by car from Sorrento and quite economical if you are a group of 3-4. 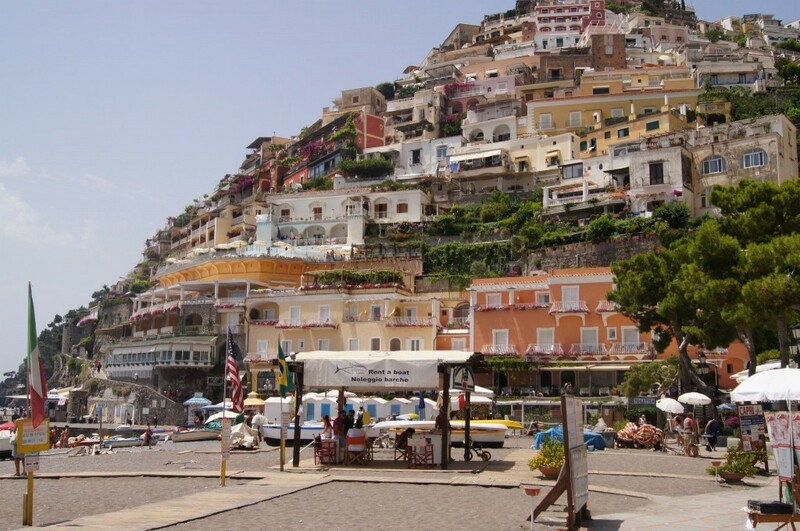 Other options are to take the Ferry from Sorrento to Positano but be mindful that most hotels are located up high and you will be carrying your luggage up many stairs. We stayed at Hotel Reginella which was well situated with an amazing view from our balcony. If this doesn’t inspire you to go to the Amalfi Coast then go hire the movie Under the Tuscan Sun and you will fall in love with Italy! I’m totally in agreeance! Everyone should visit this amazing area at least once in their lifetime! I love the Amalfi coast, especially Sorrento!!!!! Looks great! I’m heading out there in October (staying in Praiano for five days) and can’t wait. It’s absolutely stunning and picture perfect, you will love it! I’m currently traveling Italy and have heard nothing but amazing things about the Amalfi Coast. I can’t wait to explore, your input/ideas are very helpful in my planning! Thanks for stopping by my blog and yes I absolutely love Italy and the Amalfi coast is right on top of my list of favourite places in the world. It’s very much like the pictures depict. I’m glad you found my post helpful! Happy and safe travels around Italy! I hope to visit Almafi Coast soon, so I thank you for sharing this! I’ll definitely be using these tips when I visit!